Just as with all countries of the world, the Ethiopian flag is the leading signifier of the East African nation. Ethiopia is the world’s most populous land-locked country. It is one of the African countries that was never colonized. But with the Scramble for Africa during World War II, Italians started invading the independent country. With the counterattack of Ethiopian warlords and patriotic warriors, Ethiopia bounced back to normal. After the brief invasion, Ethiopia became a charter member of the United Nations. The Ethiopian Flag has gone through different versions before settling for the current one on October 31, 1996. For every pattern, the flag says something about the state of the nation. Did you know that the Pan-African flag has its root from the Ethiopian flag? Yes, the Ethiopian flag has influenced a number of flags within and outside the continent. Every flag has an embedded meaning in form of the colors, patterns, and symbols. Like most flags, the Ethiopian national flag is a sign of pride, respect, and freedom for the landlocked nation, located in the horn of Africa. The flag has three equal horizontal bands of green (top), yellow, and red, with a yellow pentagram and single yellow rays emanating from the angles between the points on a blue disk centered on the three bands. The colors were also interpreted to have a connection to the Holy Trinity, and the three main provinces of Ethiopia. The star represents the unity of the people and the races that make-up Ethiopia. The five rays on the outside of the star represent prosperity and the blue disk represents peace. The green, yellow, and red colors were used for the flag of the Ethiopian Empire in the 19th century (1897–1914). During this period, the people flew a flag with the Lion of Judah but after the Italian invasion, Menelik II towards the end of the century ordered that the flag is redesigned to have a rectangular tricolor of red, yellow, and green respectively. A popular emblem used on the Ethiopian flag was the Lion of Judah emblem. It was a part of the national flag from 1941–1974. The emblem marked the reign of Hailee Selassie and his popularity with the Rastafarian movement. This flag is still popular among the followers of the Rastafari movements and those who are still loyal to Emperor Haile Selassie. After the overthrow of Haile Selassie, various significant changes were made. First, the crown was removed from the lion’s head. 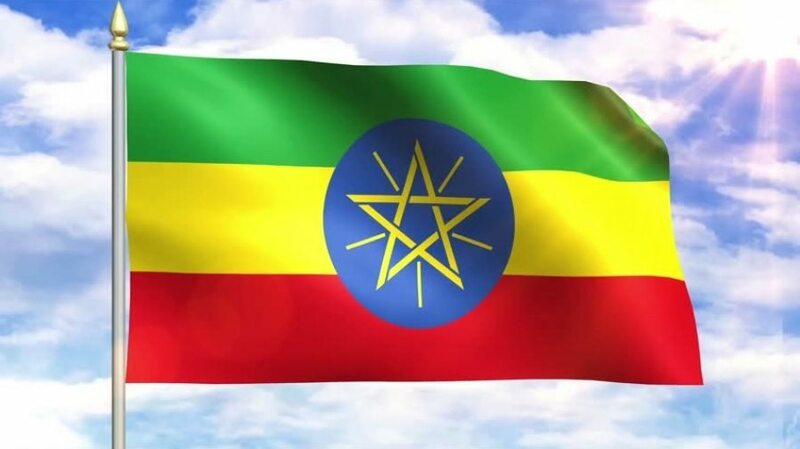 After the long journey of many turns through dictatorial regimes, the current flag of Ethiopia was adopted on February 06, 1996 which is a green-yellow-red tricolor with the national emblem at the center. The currently brighter and bigger emblem represents unity in diversity. It also represents prosperity. With slight differences, the Ethiopian flag pattern influenced other flags in Africa and beyond. For instance, the red, black and green striped pattern can be seen in the Biafran flag, Malawian flag, African National Congress, African American flag by David Hammons, Flag of Saint Kitts and Nevis, Kenyan and Libyan flag. Other African countries that share the same color pattern as Ethiopia include Senegal, Benin, Ghana, Cameroon, Bolivia, Congo, Sao Tome, Burkina Faso, Guinea Bissau, Togo, and Guinea. With a little twist, the Pan African colors take the same tricolor horizontal design of red, black and green. The red color symbolizes blood shed for freedom; black for nobility and the prestige of the black race; while green represents the natural wealth of Africa. The Ethiopian flag as provided by the constitution is not to be disrespected by any means. More so it must be used as stipulated by the law; without alterations. Using the flag without the emblem particularly could land you a one-year jail term or a fine of 5000 birrs ($214). Abebe Alambo designed the national flag of Ethiopia. It is not clear if he designed the original version of the flag which has gone through series of modification; or the current Ethiopian flag. Likewise, the year of the design is not available. What is known about the current Ethiopian flag is the date of its official adoption and its symbolic representation. The Ethiopian flag has 4 colors – green, yellow, red and blue. Every single tiny detail on the Ethiopian flag has a historical meaning and stands for something in the present and the future as well. The Ethiopian ensign is designed to have 3 equal horizontal green, red and yellow rectangles with a yellow and blue emblem at the center. While green represents hope and the fertility of the land, yellow represents justice, freedom, peace and harmony, religious peace and freedom, and the red color represents both strength and the price of their independence. The blue color of the disk symbolizes peace and the pentagram represent the unity and equality of the nationalities and peoples of Ethiopia.